Although I am not a regular CVS customer, I do happen to appreciate the wide variety of beauty products that they carry. My purchases usually only include prescriptions and less frequently beauty items such as bath salts or make-up. I am definitely one of those people that allow my coupons go to waste by shoving them in my wallet and forgetting about them until their expiration date passes. Well, not anymore (insert image and sound effects for bright rays of light), because I found out that the coupons and rewards do not expire here in San Luis Obispo for CVS. I’m not sure how the policy is in other cities and I truly hope their corporate office doesn’t decide to change their minds after reading my post. With my coupons in hand, I managed to score this small yet awesome deal. Small steps towards saving money. I had a $4 and $5 reward coupon plus a $5 off any $15 purchase. My entire purchase came to a whopping $0.39 cents. While many of these items may not be appealing to all, for a woman who enjoys nail polish, it is a total score. 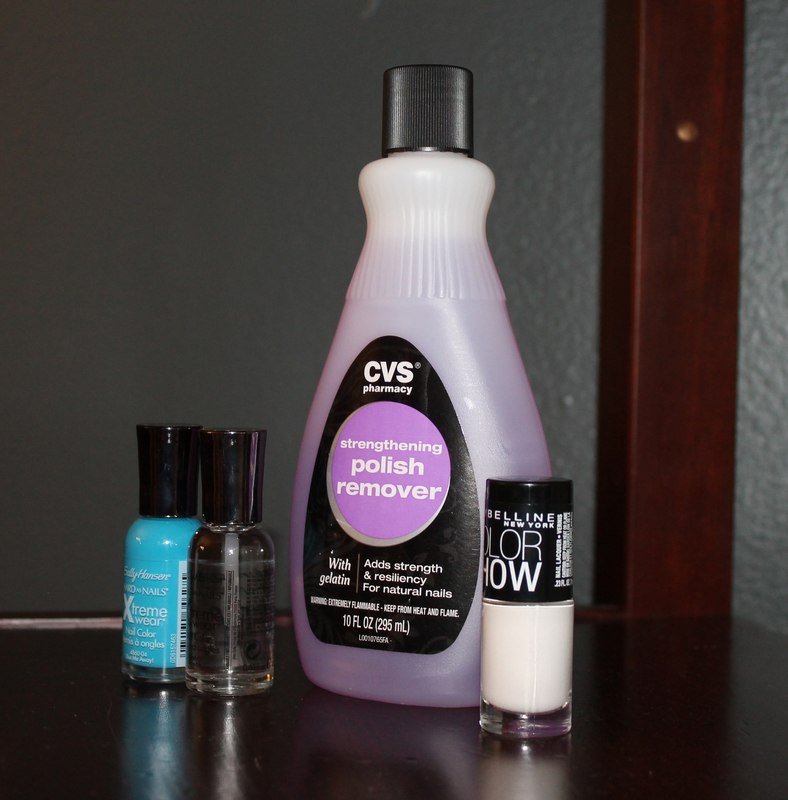 White, blue and clear nail polish and nail polish remover was purchased as seen to the right. In addition to that awesome deal, my receipts included yet another $5 reward AND a $5 off any $15 purchase. Keep in mind that rewards can be stacked AND used with the discount coupons. If you are also signed up for email coupons, do not forget to print them out. If you send the coupon to your card, it will expire when the coupon expires. Saving your rewards is the way to go until you can simply use them all at once and get some great deals in the process. 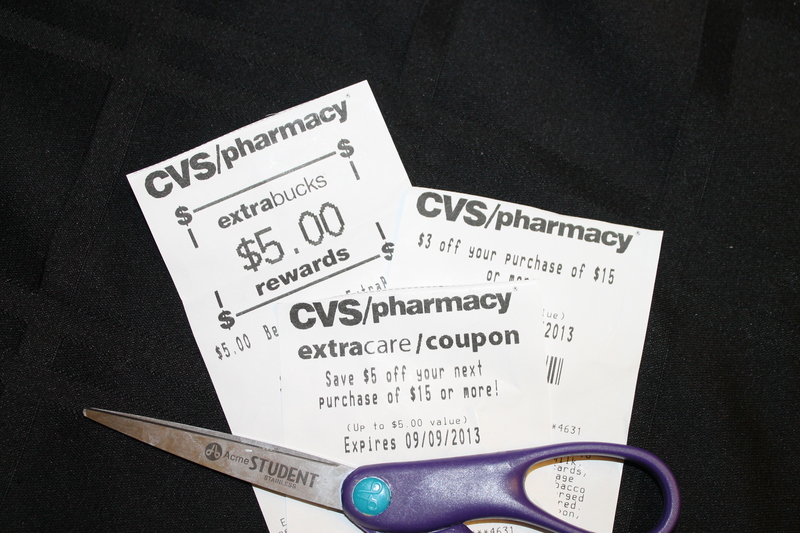 Since CVS carries lots of household items that anyone is sure to need, if you play your coupons (and rewards) right, you just may walk away with items for next to nothing. (now I know how those extreme couponers feel, sort of). Considering the recent tragedy, I thought I would post something that would be helpful for pet owners. Had I known some of this information, there may have been a different outcome. Some of these tips are from SLO Animal Services and I also added some of my own suggestions. SEARCH THE NEIGHBORHOOD: By acting quickly, you may be able to locate your pet before he has the opportunity to wander too far from home. You can make a quick trip through the neighborhood in your car, but it is important to also canvas the area on foot. This will let you look more closely at areas you won’t see when driving by. If you take a regular path when walking your dog, follow this route. Otherwise, start close to home and work outward in increasingly large circles. 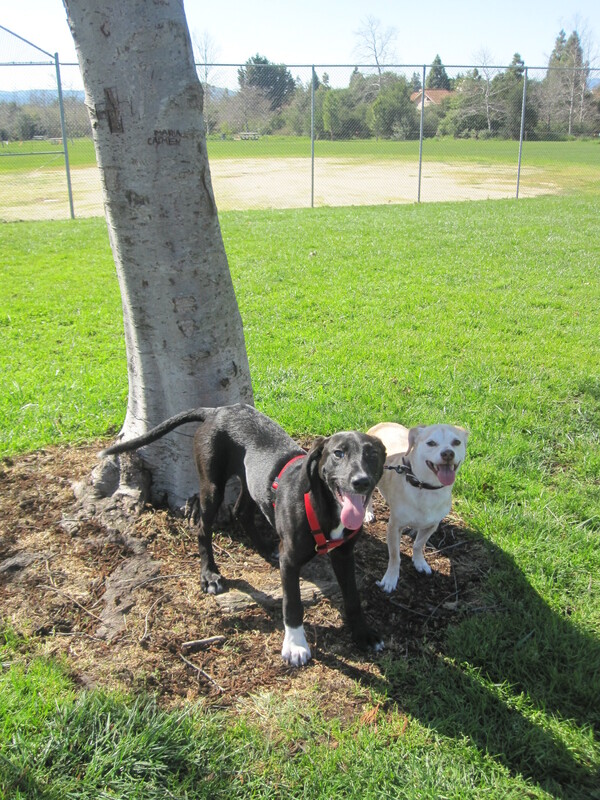 Bring a leash or carrier and even some treats to help entice your animal back to you. Don’t forget to call out to your animal as you go – looking a little silly is a small price to pay for getting your pet back home safely. If you live very close to a freeway (as I do) there may be a chance they entered the highway. If so, I would definitely recommend getting on the highway to take a look, both directions. My dog was found only three exits north from where we live, so it’s a possibility. Please just make sure that you drive with extreme caution and look safely without posing a threat to other drivers. PUT THE WORD OUT IMMEDIATELY: Talk with your neighbors and let them know your pet is missing. Bring along a recent photo and make sure that they have your phone number and address. Also, check with mail carriers, delivery personnel, and others who work in the area. Craigslist as well as many social networks such as Facebook and Instagram are able to get the word out immediately. Post something right away on Craigslist to let people know that you lost a pet and hopefully someone may help, even sightings are helpful. While you are searching the area, ASK PEOPLE who are out if they have seen your animal. Any amount of information that people can provide regarding a sighting can help your search. CHECK LOCAL ANIMAL SHELTERS/VET HOSPITALS: If someone has found your animal, they may bring them to the local animal shelter. Many places have hotlines that you can call to check. If your animal has been injured, he may have been brought to a veterinary facility. Contact the clinics in your area and provide them a description of your pet along with your phone number. CONTACT THE POLICE DEPARTMENT: While this may seem like it’s overdoing it, it doesn’t hurt to let dispatch know that you are looking for an animal. Depending on your local police department, they may be able to let you know if someone has reported an animal that you may be looking for. MAKE SURE YOUR INFORMATION IS UP-TO-DATE: Identification aids like microchips and license tags only work if your contact information is up to date. If your animal gets lost, contact Animal Services, your pet’s microchip registry, and any other pet recovery companies you have an account with to ensure that they have your most current address, phone numbers, and email address on file. DON’T GIVE UP: If you don’t find your pet right away, keep at it. Many animals are reunited with their owners after several weeks or even months. The most helpful piece of advice I would give anyone who has lost a pet is to ACT QUICKLY. Do not ever think that you are going overboard in your search because it is better to do all that you can do at that time, than look back and wish that you had done more. I would have asked more people who I came across if they had seen a dog pass by rather than just doing my drive around the neighborhood. The more people who are aware of your missing pet, the better your odds are of someone reporting something. I would never wish for anyone to receive tragic news like our family did and I hope that these tips can save just one pet from the same fate as our Angel.